With version 1.6.0 of the monitor, the EEPROM utility was introduced. The purpose of this utility initially is to read the 1 KB block of non-volatile configuration data from the 8410 and 8406 amplifiers. The configuration can be saved to disk and can be parsed into engineering units. The long-term goal is to provide an upload capability as well so archived config files can be written to EEPROM. This will allow you to restore to a known-good configuration or even to a factory default configuration. The details of the factory default - such as whether those would accompany the amp, be downloadable, etc. haven't been worked out yet at RF Concepts. Reading the EEPROM configuration isn't native functionality of the PIC microcontroller so Gordon added a command to firmware to accomplish this. The firmware version that supports this functionality is 2.03k. It is available on the RF Concepts download page. The ability to upload isn't incorporated yet even in an internal alpha version of firmware. That has to be well thought-out since any errors introduced or not detected (by the EEPROM utility and the amp itself) may result in an inoperative amplifier or worse - one operating in an unsafe manner. So, that functionality will be at least several months down the road. Launch the monitor and open the Config page. Click the Advanced tab. If your amp is off and the firmware is at the right level you can click the EEPROM Utility button. Click Connect. This starts the communication with the amplifier and disables streaming mode. As the data is being dumped the utility verifies that the checksums for the received data match the sent checksums. If there weren't any errors detected, you can click Save to save the configuration to the same directory where the monitor configuration file and fault logs are stored. You can use the Paths tab of the Config window to see the directory and optionally click the associated hyperlink to open Windows Explorer to this path. The file format is Intel Hex Object File format and was requested by RF Concepts so their EEPROM programmer could read and load these configuration files. 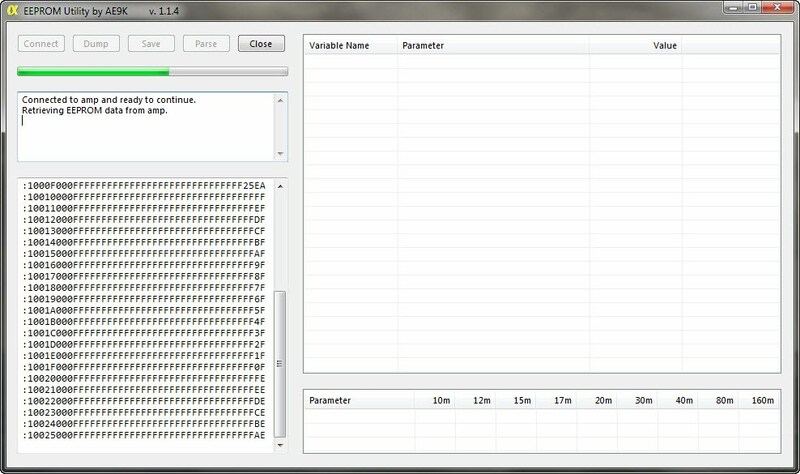 Click Parse to read the hex data and display it in a human-readable fashion. The right side below is the parsed hex data from my 8410. Some of this data is self-explanatory whereas the slopes and offsets may not be - they certainly weren't to me. According to Gordon, those are related to analog-to-digital conversion of internal measurements and unfortunately they don't have intuitive units due to the scaling they incorporate. Ok, so how is this useful? Some users have custom configurations based on their operating preferences (customized by RF Concepts on request). 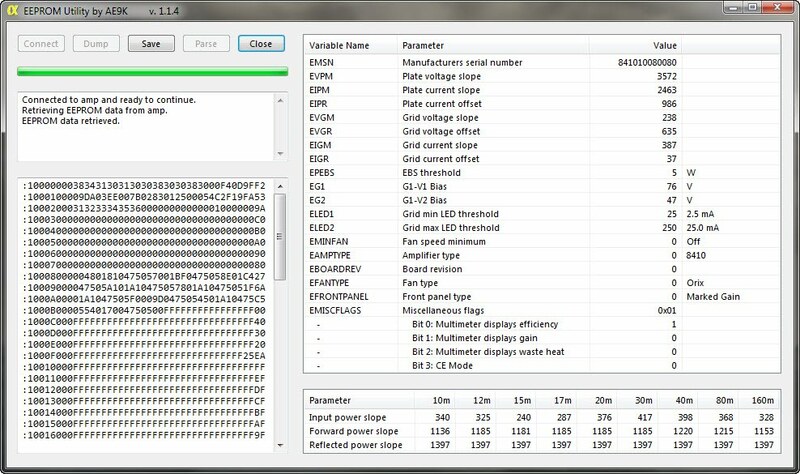 One example is having a higher idle plate current for ESSB operation. This results in fewer switching artifacts at the expense of lower efficiency and higher waste heat. This involves changing EG1 and EG2 parameters in EEPROM. Once those are changed, unless someone jotted down the original values (they're not on your factory tune/load table) then they can't easily be set back. Instead it's like having to do a bench calibration again. Having a backup serves as a reference that can be reverted to. To serve this purpose, I will be adding the ability to open previously saved config files and parsing those as well. That way we can get the value from the saved config files even if there's not yet a means to upload them into the amp.